Are you guys sick of canning posts yet? I sure hope not, because this recipe I’m about to give you is completely amazing. I mean, “STOP THE PRESSES!” type of amazing. 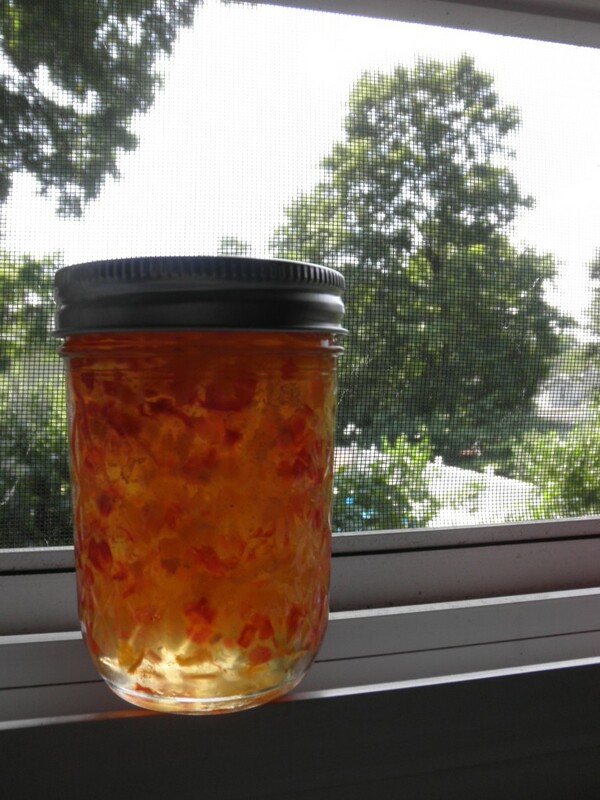 Habanero Jam? Is she kidding? It’s going to burn my mouth off. Habanero jam (this particular recipe is called Habanero Gold) is meant to be paired with cheese. And let me tell you, this stuff will knock your socks off with its deliciousness. This is the kind of jam you pay $8.99 for a teeny tiny jar in those gourmet cheese shops. But you can make it yourself with this recipe at a fraction of the cost. Special Warning: This recipe is hot, don’t get me wrong. But it’s not uncomfortably hot. And when paired with cool cheese, it’s the perfect blend of sweet and spicy. This recipe is from my fast-deteriorating copy of Ball Complete Book of Home Preserving . This recipe makes three, 8-ounce jars. I doubled the recipe when I made it and trust me, you’ll want to do that too. I just made it this Sunday, and I’m now on my second jar. It’s that good. Important Note: You must be extremely careful when handling the habanero peppers. They’re extraordinarily hot, and if you rub your eyes or touch your skin you’re going to be burned. I used rubber gloves when handling and chopping the peppers. It did slow me down, but it kept the oils off my skin. 1. In a large, deep stainless steel saucepan, combine apricots and vinegar. Cover and let stand at room temperature for at least four hours, or overnight. 2. Prepare canner, jars and lids. 3. 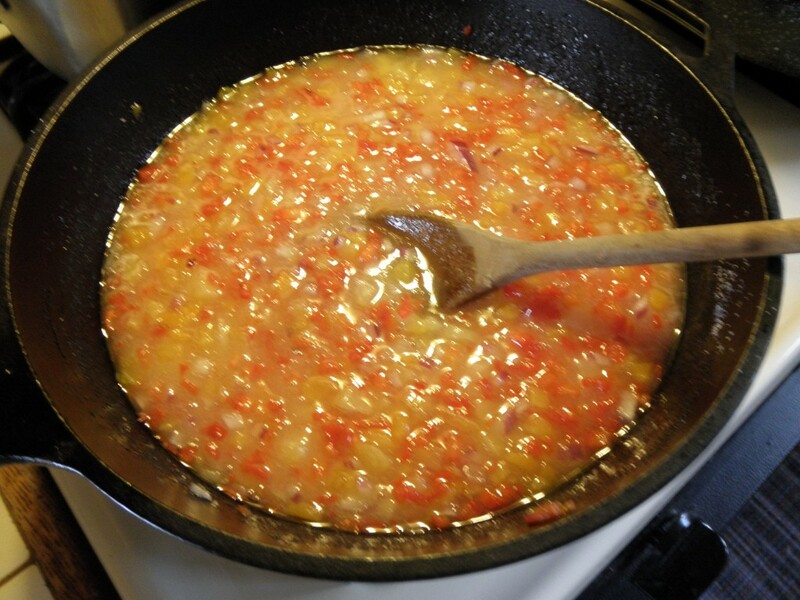 Add red onion, red pepper and habanero peppers to apricots. Stir in sugar. Over high heat, stirring constantly, bring to a full rolling boil that cannot be stirred down. Stir in pectin. Boil hard, stirring constantly, for 1 minute. Remove from heat and quickly skim off foam. 4. Quickly pour hot jelly into hot jars, leaving 1/4 in. headspace. Wipe rim, center lid, and screw band down until it’s fingertip tight. 5. Place jars in canner, making sure they’re completely covered, and bring to a boil. Once boiling, process for 10 minutes. Remove jars and let cool. Sidenote: This jam set faster than the strawberry jam, probably because it takes liquid pectin instead of powder. You’ll want to act fast once you skim the foam off! And as you fill the jars, keep stirring the pot to evenly distribute the peppers. There’s a trick to getting the peppers to suspend prettily in the jam. I didn’t act fast enough on many of mine, so several jars have all the peppers packed at the top. This is not a real problem, of course; you can always stir them up once you open the jar. But if you’re giving them as gifts (they would make awesome Thanksgiving hostess gifts) then you’ll want them to look nice. What you have to do to get them to distribute evenly is sit and wait like a cat. You have to listen for the lid to pop, which means a true seal has been created. Then, and ONLY then, take the jar and gently tilt it or twist it. The key word here is gentle. Do not turn the jar upside down, or shake it in any way! Doing this can destroy your gel and seal, rendering the jam worthless. Not good. I waited too long. The Ball book said to wait 15-30 minutes. Well by then, my gel had set and that stuff wasn’t moving. The reason the jar in the picture looks so nice is because that was one of the last jars I made, so it had a ton of peppers in it. This is, without a doubt, my best canning endeavor yet. I’m making another batch this weekend, and I have half a mind to start selling this stuff on the street. It’s like crack; one taste and you’re hooked. Especially if you have some excellent cheese. Anyway, all joking aside I definitely recommend giving it a try. It’s incredibly unique, and would make fantastic gifts. That is, if you can stand to give it away and not hoard it in your basement, like I’m doing. Thanks so much for the recipe! I was late getting my garden out, but as soon as my habaneros are ready, I will be making this jam! Oh, I loaned my mother’s Ball Canning book…I don’t think she was ever that mad at me as she was then! I do think you can get new ones? @Deborah- I wish I had started habaneros this year…I’ve been buying mine. I’m definitely planting them next year though. You can definitely get new Ball books; I bought mine last Fall on Amazon. @term- I haven’t tried it with a cream cheese yet, but that’s a great idea. I’ve been eating it with Humbolt Fog cheese, and it’s divine. I also just smeared it on rye bread tonight for dinner, and it was really good! What type of canner do you use? What brand? Is it a pressure canner or will an ordinary large pot do? @CanningNovice- I use a regular 12 qt. stockpot; that’s it. I don’t have a pressure canner (although I want one!). Can you use powdered pectin? I used a similar recipe & also used powdered pectin which I prefer. The powdered pectic makes the Jam more runny. The runny jam is easier to pour over cream cheese & serve with crackers. It is also good as a dip/sauce for Egg Rolls. I just made this recipe and it is OUT OF THIS WORLD! Oh my goodness, my mouth is having a sweet and spicy party. Thank you for posting this recipe, I’ll be making this often! This jam is out of this world delicious, I just made my second batch and doing a third. Thank you for the recipe. Great Christmas gifts!!!! I made this jam a few days ago and oh my gosh its DELISH!! Thanks for sharing. Wowza…great recipe and good tips/instructions – thank you! Never canned before, but was the recipient of some habanero peppers and didn’t know what to do with them #toohotforme. 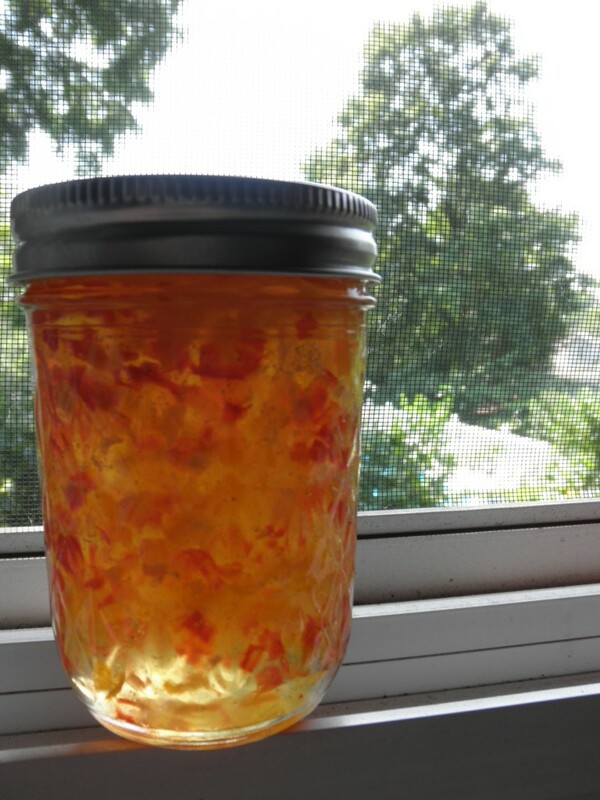 Found this recipe and watched a few youtube videos on canning and the end result was amazing! This stuff is great. I used it as a finishing glaze on both grilled and baked chicken. Even my wife, who in not a hot pepper fan, loves it. Now I have a basket full of Ghost chillies. We’ll soon see how the recipie comes out using them. OUCH!! Recently made this with the only except of adding red and yellow bell pepper, as well as, I made a very large batch (16x this recipe) All I have to say is that it turned out fantastic.. so many people have said how addictive is to eat. I might make a smaller batch next time though. Is it ok to use another sweetner other than sugar?? Great recipe and the best pepper jam I’ve ever had. Last weekend me and the brother in law decided to try it on some burgers we were grilling. Put a nice bit on the burger and let some cheese melt on top to hold it together <3 talk about a burger worthy of the gods.